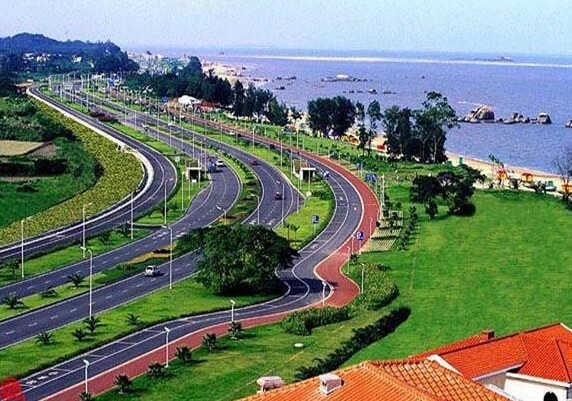 Located in the east of the city proper of Xiamen, the Wanshi Mountain Tourist Area is a famous national key scenic and historic interest zone and a AAAA tourist scenic area, with green hills, clear waters and densely growing trees. 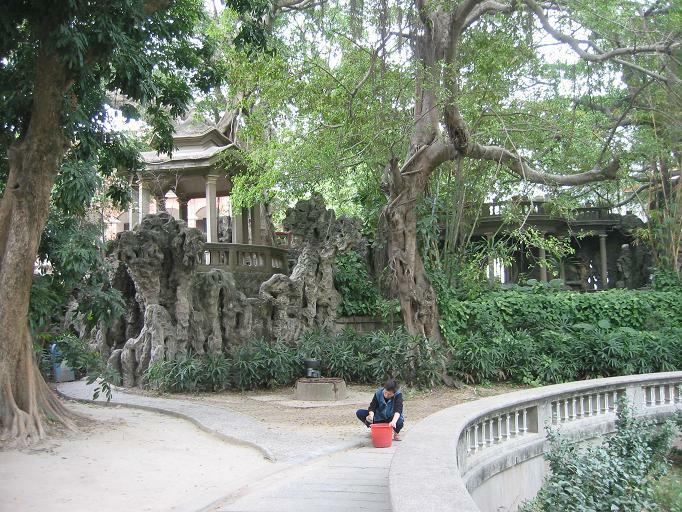 As a famous scenic area in Xiamen with historical and cultural characteristics, it is composed of rocks, forests and lakes, with well-blended artificial structures and nature. 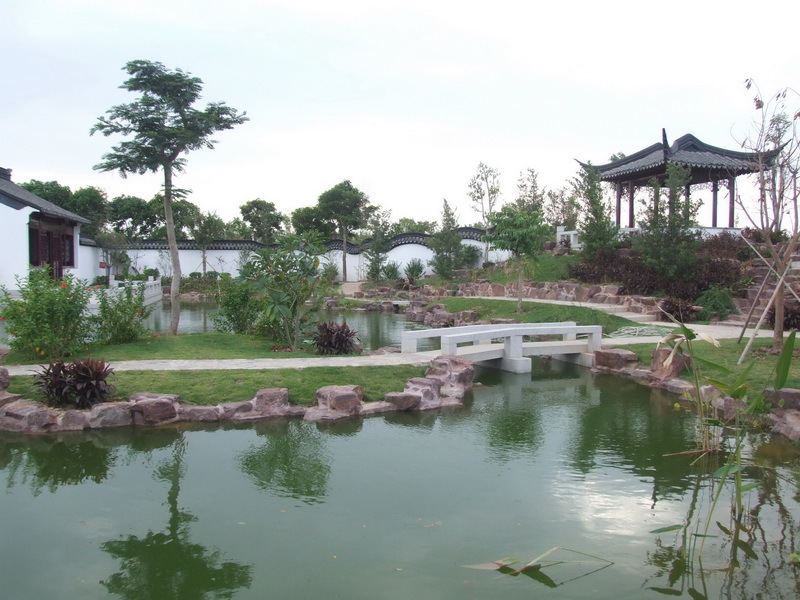 The main tourist attractions in the zone include the Xiamen Landscape Botanical Garden. Tiger Stream Rock, White Deer Cave, and so on. 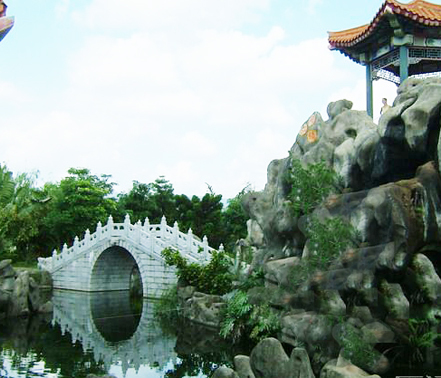 Located in Wanshi Mountain in Xiamen, it is commonly known as the Wanshi Botanical Garden. First constructed in 1960, it is a meticulously desighed garden encircling the Wanshiyan Reservoir(or Wanshi Lake), and is among the first group of the national AAAA tourist zones(spots) approved by the Chinese government, with an area of 4.93 square kilometers. Now the botanical garden grows more than 5,300 species of tropic and subtropical ornamental plants, and consists of 29 special plant gardens, each having its own unique characteristics, such as the Palm Island, Cactus World, Hundred Flower Hall, Pine and Fir Garden. With undulating hills, oddly shaped rocks scattered everywhere and numerous engravings on cliffs sculptures, the botanical garden gathers natural wonders, historical sites and landscapes made of plants. 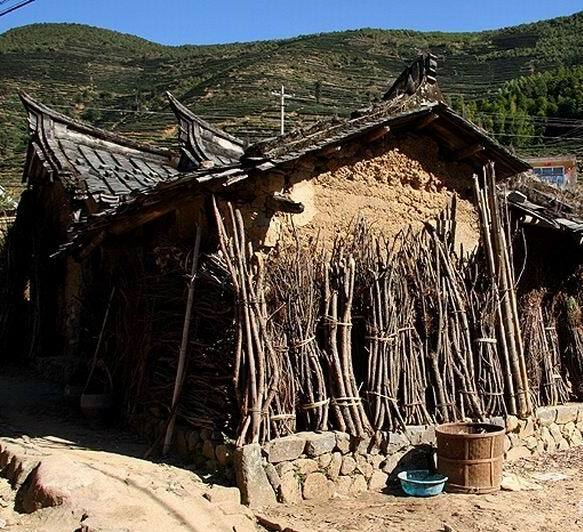 It is a tourist attraction with a long-lasting reputation in Fujian Province. As the largest cactus garden in China with an area of 40,000 square meters, the Cactus World grows over 1,200 species of desert plants, which fall into 32 families, and is divided into the Outdoor Exhibition Zone and the Hothouses. In the Outdoor Exhibition Zone, tourists can find the Buddha? ?s belly tree in the shape fo a huge bottle, the high and magnificent candlenut tree, the Tai-kan euphorbia and screw pine trees. It leads the country in growing and exhibiting cactus plants in a large scale. 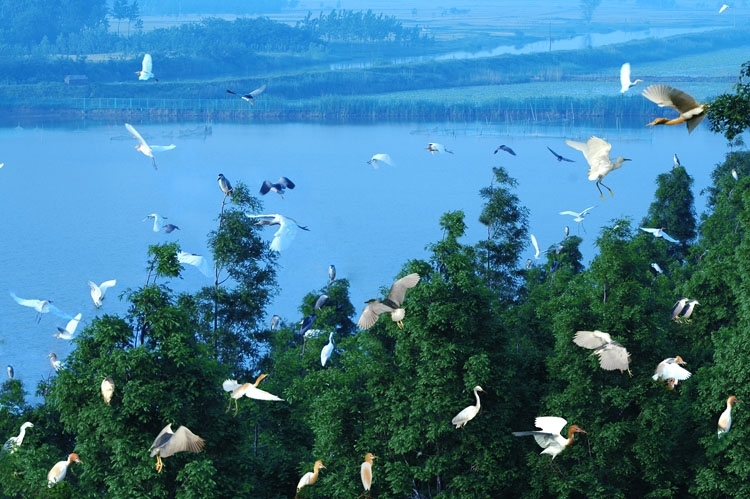 The Landscape Botanical Garden is an important Component part of the Gulang Islet.Wanshi Mountain National Zone of Scenic and Historic interest. Except for the scenic spots made of plants, it also gathers a number of natural wonders and historical sites, such as Taiping Laughing Rock,Morning Bell in Heaven, Ten Thousand Tablets Facing Heaven,Jade Tablet on a Rock, Tianjie Temple, Wanshi Lotus Temple and Taipingyan Temple. The Sun Yat-sen Park, the Monument to Revolutionary Martyrs and the Cemetery of Martyrs are nearby. Transport: Bus Nos .3,12,17,18,21,27,32,35 and 67 go directly to the botanical garden. Tiger stream Rock is to the southwest of Wanshi Rock and to the west of Drunken Immortal Rock. Under the rock ,there lies a stonecave, in front of which is the source of a stream,know as Tiger Stream, Huxiyan(Tiger Stream Rock ) Hill is covered with natural huge rocks in various kinds of weird shapes ,hence the saying:?? The rock is surrounded by oddly shaped stones showing uncanny workmanship. 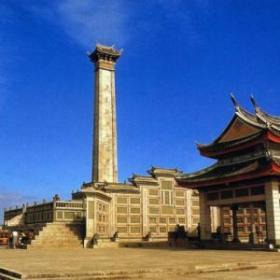 On the hill stands the Donglin Tempel, also called the Huxiyan Temple,which was first constructed in the Tang Dynasty(618-907) and was later renovated time and again. 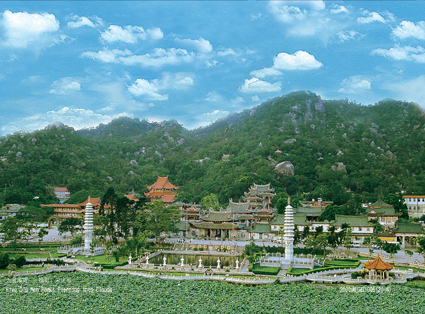 Built on the hillside, the temple takes stone caves as the rooms, and includes some scenic spots, such as te Tiger Tooth Cave, Night Moon Cave, Narrow Heavenly Path and Flying Whale Rock. The bright moonlight adds mysterious colors to the temple, so that it is the best place to appreciate the full moon at the Mid-Autumn Festival. To the left side of the temple stands the Night Moon Cave, also called the Lying Tiger Cave, which holds a clay-sculptured tiger. At the Mid-Auturn Festival every year, when the moonlight shines on the head of the tiger with its bright and piercing eyes wide to watch outside, making people terrified by the sight of it, hence the name "Moonlit Night at Tiger Stream Rock" is one of the eight major traditional scenic spots of Xiamen, and one of the 20 famous tourist attractions of Xiamen as well. Located on the back of Tiger Stream Rock, White Deer Cave is full of rocks, caves and valleys. 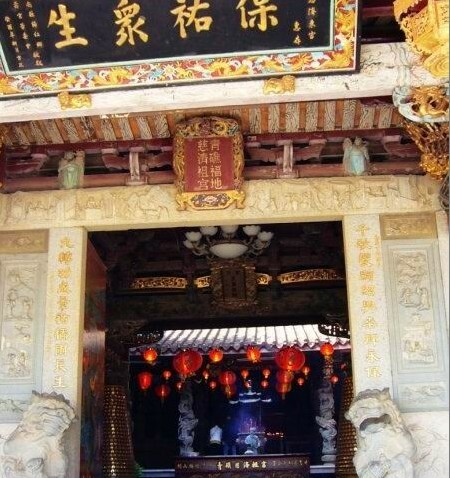 The Bailudong( White Deer Cave) Temple was first constructed in the Ming Dynasty, and was renovated in the Qianlong reign of the Qing Dynasty when the Three Treasure Hall, Chaotian Cave and Liuhe Cave were built. In the Wanli reign of the Ming Dynasty when the ? ?storied stone room?? was dug, Wanzai Cave was discovered. 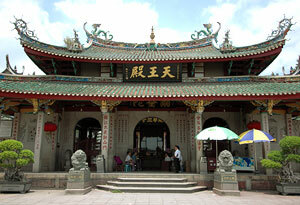 Other structures in the temple include the Grand View Tower, Xianshan Pavilion, Buddhist halls and rooms for monks, etc. 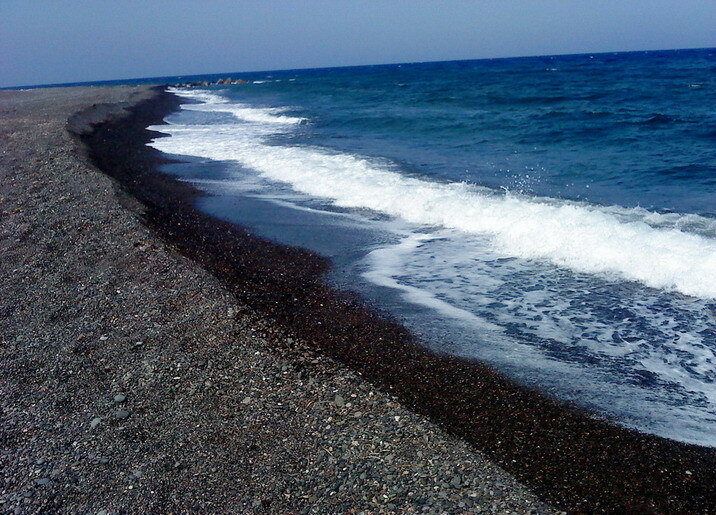 Standing at a high place, tourists can have a panoramic view of the whole islet. Originally, in front of White Deer Cave there was a small pool in the shape of a half moon, with clear and sweet stream water from the rock cracks in the Rear Hill, known as Dragon Spring or Gurgling Stream. A stone room sits on the Dragon Spring, which enshrines a statue of Zhu Xi(1130-1200), a famous philosopher and educationist of the Southern Song Dynasty). Legend has it that Zhu Xi once gave lectures at White Deer Cave in Lushan Mountain, Jiangxi Province, so it is called White Deer Cave. In the cave, there is a clay sculpture of deer, facing the entrance. Between the end of spring and early summer every year when air humidity increases, and vapors go up, smoke and mist can be seen coming out of the deer's mouth, hence the scene:Â White Deer Holding Smoke in the Mouth,?? which is one of the eight lesser scenic nights of Xiamen.